43545 RA6510.JPG 500X638\RA6510.JPG 43546 RA6510_1.jpg 500X638\RA6510_1.jpg Send A Hint! 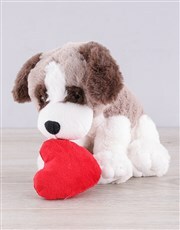 Product Description: less text Be the sender of smiles with this adorable dog heart teddy which comes complete with a box of Lindt Lindor Milk Truffles (125g). You can't go wrong with chocolates and cuddles! Get this Puppy And Lindt Gift delivered with NetFlorist.